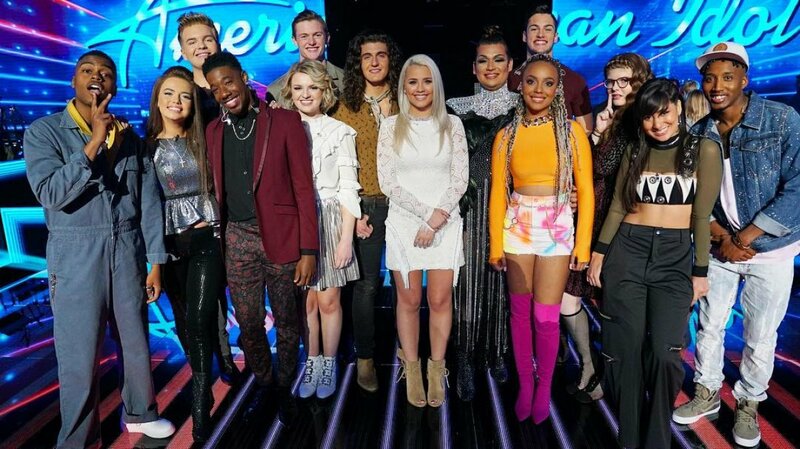 'American Idol's Top 14 contestants perform -- Catie Turner, Maddie Poppe, Jurnee, Gabby Barrett and Michael J. Woodard impress! American Idol's Top 14 contestants performed for home viewer votes during Sunday night's two-hour broadcast on ABC. Fighting for a spot in the Top 10, American Idol's Season 16 artists took the stage one at a time in Los Angeles in front of a screaming audience as well as Idol judges Katy Perry, Lionel Richie and Luke Bryan. "The power is in America's hands," host Ryan Seacrest said at the top of the show, adding that the next "American Idol" will be crowned in only four weeks. Out of the 14 performances, the artists who got the judges up on their feet were Catie Turner, a 17-year-old high school student from Langhorne, PA; Maddie Poppe, a 20-year-old college student from Clarksville, IA; Jurnee Weathers, an 18-year-old hostess from Denver, CO; Michael J. Woodard, a 20-year-old bowling alley attendant from Philadelphia, PA; and Gabby Barrett, a 17-year-old high school student from Pittsburgh, PA.
Catie performed "Take Me To Church" by Hozier. Lionel called her "authentic" and original, and Katy said she wants to sing with Catie in the near future and the artist knows exactly who she is and wants to be. "You can win this thing," Luke said, asking Catie to ignore the haters and Internet trolls out there. Maddie sang "Homeward Bound" by Simon and Garfunkel. Lionel believes Maddie could win American Idol, and Katy admitted she had closed her eyes during the performance and thought she was listening to Joni Mitchell, which was a huge compliment. Katy explained Maddie is special and has "incredible musical tastes." "I pray the people at home felt what I just felt... Big time pro," Luke noted, adding that Maddie "knows what the hell [she's] doing. Jurnee took the stage with "Bang Bang" by Jessie J., Ariana Grande and Nicki Minaj. The judges loved watching Jurnee work the stage and use her body. Luke thanked her for a showing a different side of herself and "bringing it," and Lionel told the artist she had affected everyone. Katy also noted that Jurnee proved herself to be an artist through this performance and not a future wedding singer. Michael sang "Titanium" by David Guetta featuring Sia. Katy called him "a star" and gushed about how he belted out the song incredibly. "I felt it in my heart from Day 1 that people are just going to love you... You pull us in and make us love you a little bit more every time we watch," Luke gushed. Lionel added that Michael is "a Martian" because he was performing on another level that's "so pure." And Gabby sang "The Climb" by Miley Cyrus. Luke admitted Gabby had his favorite vocal of the night and acknowledged she's "not playing around anymore." "You went through the star wash," Katy joked, adding that Gabby looks and sounds like a star. And Lionel agreed the judges were watching the beginning of a star being born on the stage. The other contestants delivered great performances as well; however, the judges gave them more criticism and things they need to work on going forward. Caleb Lee Hutchinson, an 18-year-old musician from Dallas, GA, who has lost over 80 pounds since auditioning for the show, sang "Midnight Train to Memphis" by The Steeldrivers. Katy was blown away by Caleb's transformation, but she said his nerves "tainted" his performance a little bit. Michelle Sussett, a 22-year-old waitress from Miami, FL, performed "Friends" by Marshmello and Anne-Marie. Luke said Michelle became a pop star that night, but Katy didn't think the song best represented all of her talent. Katy advised Michelle to think about how her performances may translate for viewers watching at home, as it's obvious she can get a live crowd going. Marcio Donaldson, a 28-year-old server from Compton, CA, sang "It's a Miracle" Barry Manilow, and Lionel told him to "keep developing and growing" but he's "on fire." Luke wasn't sold on the song, but he was glad Marcio showed a different element to his artistry. Mara Justine, a 15-year-old high school student from Galloway, NJ, performed "This Is Me" from The Greatest Showman. Katy confessed Mara didn't arrive vocally until the middle of the song and she's better than that. Luke was also not emotionally invested in the performance, but the judges all agreed Mara has a voice that can blow the roof off a venue. Garrett Jacobs, a 17-year-old high school student from Bossier City, LA, sang "Raging Fire" by Phillip Phillips, and Luke said the performance was "a little pitchy" but his vocals were "dynamic" and tender. Garrett also looked comfortable on the stage. Adam "Ada Vox" Sanders, a 24-year-old entertainer from San Antonio, TX, belted out "The Show Must Go On" by Queen. Lionel gushed about how Ada has no idea how fabulous she is and she came "to stop the show." Lionel wants to see Ada reach the top. Cade Foehner, a 21-year-old college student from Shelbyville, TX, sang "Black Magic Woman" by Santana. Luke said Cade did not deliver a crazy vocal performance, but the artist still managed to get a big response from the audience through his guitar playing. Katy also hilariously took a piece of Cade's hair, saying it's for her mother who is "obsessed" with the contestant. Dennis Lorenzo, a 26-year-old singer from Philadelphia, PA, performed "In My Blood" by Shawn Mendes. Lionel said Dennis broke through the ceiling with that performance and took the next step in his career. Katy said it was shaky at the start but she became a believer as the song progressed. Katy also realized Dennis is an alternative R&B singer, as he's got some rock inside of him. And Jonny Brenns, an 18-year-old college student from St. Augustine, FL, sang "This Is a Gospel" by Panic! At the Disco. Lionel explained it's obvious Jonny had fun on the stage this time and his energy was "infectious." Katy said he could work on the notes more but has grown so much. Luke also pointed out how American Idol is pushing Jonny to become better and really testing his abilities. On the upcoming Monday, April 23 broadcast of American Idol, the Top 14 will become a Top 10. America's votes will advance six artists automatically into the Top 10, and then the remaining eight hopefuls must battle for the remaining four spots selected by the judging panel. Exclusive: Libby Vincek talks 'Survivor: Ghost Island' -- I was wrongly judged by my appearance, I played my heart out!